Utrikespolitiska institutet var med och arrangerade Gullrandadiskussionerna och slutförde ett forskningsprojekt med anknytning till hybridpåverkan i demokratier. Utrikespolitiska institutets forskare publicerade nio peer review-granskade artiklar före utgången av maj 2018. The Kultaranta Talks on 17-18 June 2018 concentrated on the future of the international order, the multilateral system and international climate policy. Hosted by President Sauli Niinistö at Kultaranta in Naantali, the event focused on foreign and security policy was held for the sixth time. Among the many speakers were UN Secretary-General António Guterres, Prime Minister Juha Sipilä, Vice President of the European Commission Jyrki Katainen, Nobel Peace Prize Laureate Martti Ahtisaari, former Swedish Prime Minister Carl Bildt and FIIA Director Teija Tiilikainen. The Office of the President of the Republic of Finland organised the event in cooperation with FIIA. A team of FIIA researchers (Mika Aaltola, Harri Mikkola, Mikael Wigell and Antto Vihma together with Tapio Juntunen from University of Tampere) have produced a report on hybrid influencing and the vulnerabilities and resilience of democracies (in Finnish). The project was funded by MATINE (The Scientific Advisory Board for Defence) and it was led by Programme Director Mika Aaltola. FIIA’s Scientific Advisory Council (SAC) had its annual meeting 24-25 May. SAC met for the first time in its new composition which has been nominated for a three-year period 2018-2020. It re-elected Volker Perthes, the director of the SWP in Berlin, as the chairperson. 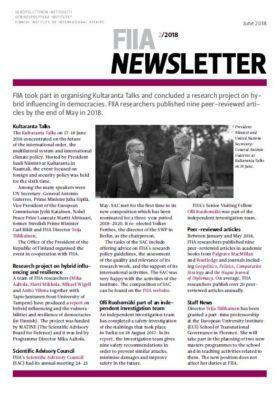 The tasks of the SAC include offering advice on FIIA’s research policy guidelines, the assessment of the quality and relevance of its research work, and the support of its international activities. The SAC was very happy with the activities of the institute. The composition of SAC can be found on the FIIA website. An independent investigation team has completed a safety investigation of the stabbings that took place in Turku on 18 August 2017. In its report, the investigation team gives nine safety recommendations in order to prevent similar attacks, minimise damages and improve safety in the future. FIIA’s Senior Visiting Fellow Olli Ruohomäki was part of the independent investigation team. Between January and May 2018, FIIA researchers published nine peer-reviewed articles in academic books from Palgrave MacMillan and Routledge and journals including Geopolitics, Politics, Comparative Strategy and the Hague Journal of Diplomacy. On average, FIIA researchers publish over 20 peer-reviewed articles annually. Director Teija Tiilikainen has been granted a part-time professorship at the European University Institute (EUI) School of Transnational Governance in Florence. She will take part in the planning of two new masters programmes to the school and in teaching activities related to them. The new position does not affect her duties at FIIA. This year’s second issue of Ulkopolitiikka, the Finnish Journal of Foreign Affairs, focuses on Russia’s foreign policy tools and strategies. The main story depicts how Russia actively tries to narrow down the room for maneuver of the West, deepens its ties with China, and keeps most of its options open towards the key players in the Middle East. In the profile interview, FIIA’s Visiting Senior Research Fellow Leo Michel sheds light on why the world still needs nuclear weapons. In addition, Ulkopolitiikka analyses how similar or dissimilar Europe’s right-wing parties are, and looks at why gender inequalities persist in international politics. The Journal is available both as a printed journal and as an e-paper at lehtiluukku.fi. The Journal will launch a new website this summer. All FIIA publications are available on the Institute’s website. The US-Japan-India-Australia Quadrilateral Security Dialogue: Indo-Pacific alignment or foam in the ocean? Russian-Chinese relations in Eurasia: Harmonization or subordination?